snowdeal.org > ex machina: the eric update - day 221: happy birthday, flickr! the eric update - day 221: happy birthday, flickr! flickr is one year old! which means, i guess, that they grow'd up along with odin. 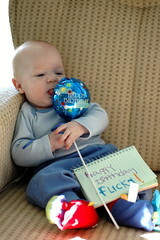 you'll notice that he discovered for the first time that balloons are fun to lick. i'd like to know what sort of super balloon material they found to make this particular balloon because it's the same one we bought on day 62 to celebrate his second month birthday. That stuff is crazy - we've had a similar balloon for at least a year and a half now, and it's just as puffy as when it arrived. It may be 2.5 years, but definitely at least 1.5. Out of control. i thought mylar balloons eventually deflated, but i might be thinking of mylar balloons with helium inside. maybe mylar balloons with heavy ol' air can stay inflated indefinately?